Nestled in the foothills of northwest Colorado Springs, The Sanctuary at Peregrine is a collection of home sites sitting among the ridges, picturesque sandstone outcroppings and hoodoo rock formations of the prestigious Peregrine neighborhood. Our executive enclave of exceptional homes creates private living, while retaining proximity to everything Colorado Springs has to offer. Interstate 25, suburban mall shopping, Academy District 20 schools, the United States Air Force Academy and downtown Colorado Springs are all easily accessible, yet seem a world away. Stonegate Homes has been changing the face of Colorado Springs for many years — making our city even more beautiful with our unmatched style and flair, incomparable skill at master planning and meticulous attention to every last detail. The Sanctuary at Peregrine is no exception — offering the eye-catching Mediterranean and California-style architectural features that capture the very essence of estate-like homes. Monday - Thursday by Appt. Directions: From Interstate I-25 take Woodmen Road (Exit 149). Heading west turn Right on Woodmen Road (at the Second Stop Light - 4/10 of a mile). Follow Woodmen Rd. for 2 3/10 miles, and turn Left at Orchard Valley Rd. Continue to first street on left, and turn Left onto Solitude Lane. Go to the Right up the hill for 1/10 of a mile, and then turn Right at the private drive. The first house on the Right is the Model Home - 7636 Solitude Lane. 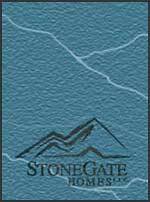 Stonegate Homes is a new home builder in Colorado Springs & new home builder in Estes Park, Colorado. Stonegate Homes has been designing and building exceptional custom homes for over 30 years.